One of the world’s largest international cruise ships, carrying about 2,800 international visitors and 1,080 crew members from Hong Kong, docked at the SP-SSA International Terminal (SSIT) in the southern Vietnamese province of Ba Ria - Vung Tau on Friday morning. Sapphire Princess, one of the ten grand-class cruise ships owned by the five-star premium cruise line Princess Cruises that entered service in 2004 with port of registry in London, has become one of the first passenger cruise ships to arrive in Vietnam in the Lunar New Year 2019 that began on February 5. The ship has a capacity of 116,000 tons and is capable of accommodating nearly 4,000 people in 18 stories with 1,337 five-star rooms. It offers five restaurants, a casino, a library, many swimming pools, a fitness center and a spa, as well as many other convenient facilities. 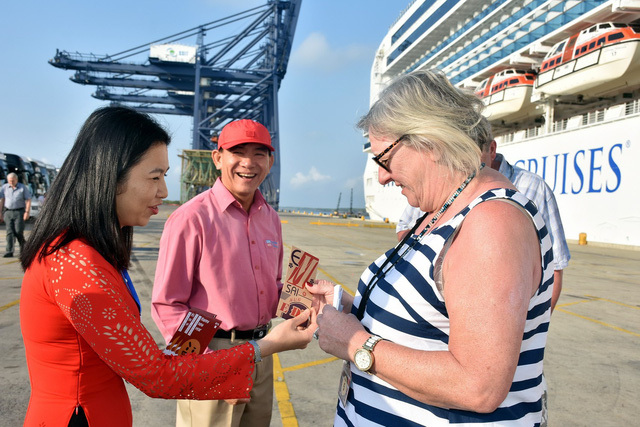 Upon Sapphire Princess’ arrival, Tran Thi Thu Hien, deputy director of the Ba Ria - Vung Tau department of tourism, came to the port to welcome the first batch of tourists to visit Vietnam via a seaport in the new lunar year. Hien gave the international visitors lucky money as per the Vietnamese custom of celebrating the Lunar New Year (Tet) holiday. After quick seaport entry procedures, tourists traveling on the ship were carried by Tan Hong Tourism Company to visit famous places in the locality such as Hoa Long Market, Ba Hong Fruit Garden, rice paper village, Hoa Long Wine Brewery, and Long Phuoc Tunnels. 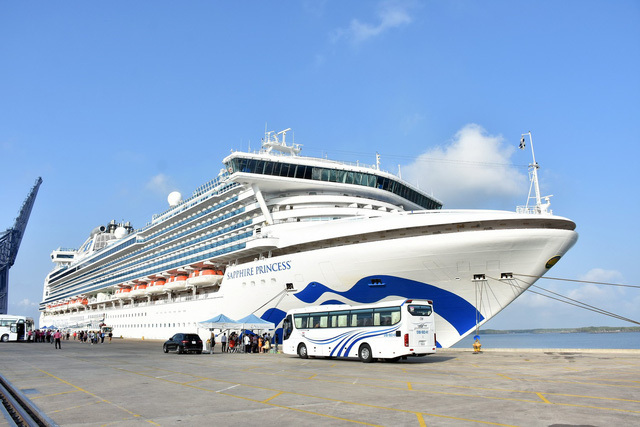 In 2018, Princess Cruises’ six cruise liners, namely Majestic Princess, Sapphire Princess, Diamond Princess, Golden Princess, Sun Princess and Coral Princess made 31 trips, carrying over 80,000 holidaymakers to Vietnam, according to the Vietnam News Agency. Previously, Cai Mep International Port, which is also located in Ba Ria – Vung Tau Province, welcomed the Maersk Evora container ship, which carried 2,003 containers, in the morning of February 6.